Successfully Added HOMTOM S16 Fingerprint 2GB RAM+16GB ROM Dual SIM Standby Android 7.0 Smartphone Black to your Shopping Cart. 5.5" 640*1280 HD IPS 18:9 full display offers wide and big visual effect with vivid and bright. Powered by MTK6580 quad-core processor, runs on Android 7.0 OS, give a balance between performance and power-efficiency. 2GB RAM+16GB ROM, along with 64GB expandable memory, guarantees the speed of reading and writing data, provide enough space for storing songs, videos etc. With a 3000mAh removable battery, 13MP rear camera and 8MP front camera, supports dual sim dual standby and fingerprint unlock. The HOMTOM S16 picks out three gorgeous color which makes you smell of vigour of youth--- Macaron Blue, Noble White, Gentle Black. These three colors perfectly reflect the texture of the special back cover, giving you a sense of refreshing and relaxing feeling. The elegant S16 will be your best selection in the Autumn. The HOMTOM S16 adopts a 5.5-inch large full screen so that the view can be displayed more completely. On the other hand, choosing the 18:9 Aspect Ratio makes it look slender and slimmer. See more but hold less. With quite a big but affordable size and 18:9 aspect ratio, the HOMTOM S16 is such a sleek and ergonomic smartphone. Hold it in one hand, make it more convenient. 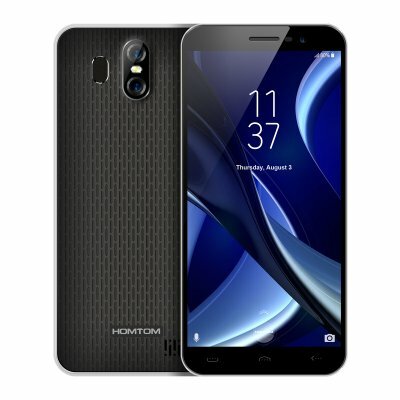 Instead of the heavy metal texture, the HOMTOM S16 chooses the plastic material which is lighter and more portable, but without the low-cost appearance. It is with dotted sequins specially designed on the cover, making the phone more outstanding and aesthetic. Worry about shooting the scene unreal? The S16 can play a role as your private memory recorder by producing high-quality HD images with extreme clarity thanks to its 13MP pixel and 2MP pixel dual camera. Besides, it can be used for panoramic shooting with HDR and Auto-focus. The HOMTOM S16 is equipped with an 8MP front camera, which goes with beauty effect and facial beautification. Shooting pretty you and your friends. The HOMTOM S16 chooses 640*1280p HD display resolution so as to bring natural and sharp views on your phone. This resolution mostly fits the size 5.5-inch of S16. The speaker of HOMTOM S16 is installed at the corner of the back cover, which provides a perfect and balanced sound effect when using the loudspeaker in a landscape mode, avoiding the difference for two ears.